You are here: Home > Blog > Flora & Fauna > Unusual or exotic trees : The Quince, Cydonia oblonga. The quince is endemic (native) to south west Asia, the Caucasus; an area occupied by countries like Turkey, Georgia, Northern Iran, Azerbaijan, and Armenia - where it can be found growing on rocky slopes and woodland margins. The quince can survive in a variety of climates. It even flourished (in historical times) in the heat of Mesopotamia, however, in order to flower properly it needs to experience a cool or cold period when the temperatures drop below 45oF. It belongs to the Rosaceae (Rose) family, which also includes apples and pears. 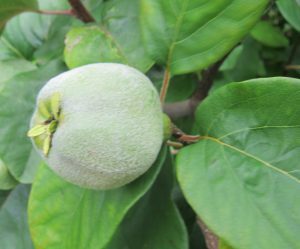 The fruit of the Quince is not dis-similar to a pear but it is generally larger, ‘knobbly’ and a bright ‘golden yellow’ colour. The tree itself can grow to a height of 5 to 8 metres and to a width of some 5 metres. 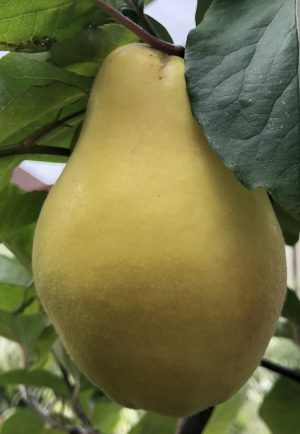 Left alone, the quince can form a thick bush or rather distorted, small tree but when pruned and reduced to a single stem a fruit-bearing tree of commercial value results. Quinces can also provide rootstock for grafting. A rootstock is a stem with a well developed root system, to which a bud from another plant can be grafted. The bud is often from a pear cultivar. The leaves of the tree are simple, with an entire margin (no teeth or serrations), covered with fine hairs (when first formed) and arranged alternately along the stem. The flowers (which appear in Spring) are white, with five petals and sepals. Self-fertilisation can occur but generally more fruits are produced when cross pollination occurs. The immature fruits are green and feel soft - as they are covered with a fine, greyish hairs. The hairs tend to be lost as the fruit matures. The fruits are left on the tree to ripen fully and harvested in late autumn - before the first frosts. The flesh of the fruit is formed from the receptacle of the flower; it is hard and has a distinctive smell / taste (due in part to ethyl 2-methylbutyrate - see Mabberley’s Plant Book). The carpels are embedded within this flesh and it within them that the seeds (pips) form. The seeds contain nitriles. Nitriles are not uncommon in the Rose family. They are organic compounds which can release cyanide - when hydrolysed (split open). 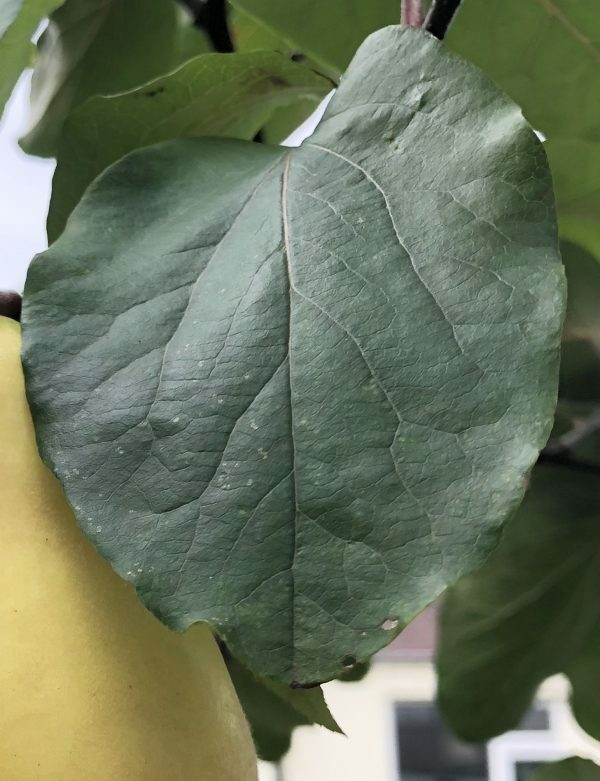 The trees are generally quite hardy but can succumb to certain fungal diseases (particularly in wet and warm weather), for example, quince leaf blight & cedar quince rust. The quince can also act as a food plant for a number of moths. Quinces are not grown in quantity (like apples and pears) but one or two quince trees are often added to a mixed orchard with apples and other fruit trees. The quince can be used in the preparation of sweet and savoury dishes. Unusual or exotic trees : the crab apple or wild apple tree. Unusual or exotic trees – The Medlar (Mespilus germanica).